We have a beautiful Vagabond 42 for sale, so I am posting back my brokerage research. And in the case of Vagabonds, information online is pretty slim, so I feel good that I am positively contributing back to the Internet knowledge base. Jack N. Chen founded the shipyard Bluewater Yacht Builders in Taiwan and produced Vagabond sailing yachts during the 1970’s and 1980’s. The earliest sold Vagabond listed in the brokerage records is a 1974 Vagabond 47. The next earliest is a 1976 Vagabond 39 that we, Jordan Yachts, sold in ’06 I can proudly say. The subject of this review, the George Stadel designed 42-footer, was produced from 1978 until at least 1991. Hull #1 was delivered in late 1978 and was a cutter rigged version. She and her sisters, the 47, 39, and 52, share the classic charms of pirate ship inspired detailing from their clipper, trailboarded bows to square windowed sterns. An exuberant use of teak makes these stout under sail (the 42 is rated at 32,000 pounds displacement) and elegant down below. Let’s take a look at what is known about these yachts. I met a wonderful couple who knew the style of yacht they were looking for – that being something like a Vagabond 42. When walked up to her, you could see the joy in their eyes and with a sigh exclaim that this is the type of yacht that captures their romantic dreams of sailing the seven seas. The long bowsprit, trailboards, clipper bow, and mermaid figurine work together so well. In Newport and Annapolis yachtsmen race light displacement Farr designs. In balmy South Florida we are a step away from the rose-tinted dreamers who sailed the Caribbean a couple centuries ago. We enjoy cruising tropical islands in clear, green waters. This creed is what Stadel’s design represents. Draft is 5’6″ so excellent to sail the Bahamas. Back in Jack Chen’s days, fiberglass hulls were built thick enough to crush reefs underhull like mowing weeds down in a field. The deck may be solid, balsa, or plywood cored and teak lined though these days some have had their decking removed. The main mast is stepped on a stainless compression post in the salon. Twelve thousand pounds of cast iron are encapsulated in the keel for ballast and glassed over. The Alloy spars are painted to prevent corrosion. The Vagabond 42 often comes with teak decking. While a great non-skid and beautiful, most clients seem to prefer yachts without teak decks because of the costs to maintain and eventually refinish a teak deck. I think teak decks are a waste of a plundered natural resource if nothing else. Along with the decking are solid teak handrails, bulwarks, and foredeck lockers. While restoring blighted brightwork is not a big expense, do not underestimate the long term commitment needed to maintain exterior teak. The centercockpit is large, deep, and dry. Lazarettes and a propane locker are aft on the raised quarterdeck. Through the companionway, you will struggle to find any glass or veneer in the solid teak interior. Layouts vary but can be broken down into two or three stateroom versions, The three statement version has a vestibule cabin along the starboardside walkthrough and moves the master head portside. I cannot think of a better value for a three stateroom centercockpit vessel than this Vagabond 42 version. The listed engine per original specifications was a 90HP Ford Lehman. Access is excellent on the version with the vestibule cabin alongside the walkthrough under the cockpit. The companionway hatch was explicitly designed to be wide enough to allow removal of the engine. The companionway stairs were removable to allow the engine to slide forward on the engine bed (with use of a come-along strapped to the mainmast compression post) until it was able to be lifted out of the companionway hatch. Fuel tankage varies around 120 gallons in two stainless steel or black iron tanks. Water capacity is similar at 110 to 160 gallons. Underneath she features a surprisingly modern keel-rudder arrangement with a long fin keel and skeg hung rudder. Her high freeboard, clipper bow, and deep cockpit suggest a dry ride. She is not a racer, and I would not be surprised or consider it a fault if she needed help from the old iron genny to come about. 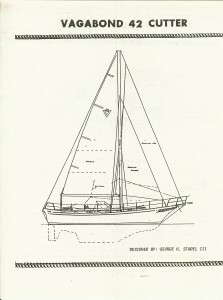 The main spar on ketch versions has 55′ clearance. One owner mentions how the rudder surface area created a lot of force at the wheel with the original Edson cable steering. He resolved this by using chain sprockets to gear up the force applied at the wheel. There was plenty of space for this modification because of the height of the cockpit floor over the engine room. The changes made for more wheel revolutions to get from lock to lock, but better handling especially in heavy weather. The Vagabond 42 is a great looking traditional ship with heavy construction. Her interior is finished well by Bluewater Yacht craftsmen in solid teak. Other comparables include her sisterships from 39 to 52, the Formosa / Force 50, the Garden designed Mickelson-Hudson 51, Cabo Ricos, Irwins, and Gozzard designs. Nothing else captures the romance of sailing like these classic lines. Please comment below if you know more about these yachts.